The Green Business Bureau grants PreCheck, a Houston-based leading healthcare background screening and employment verification firm, with Gold level green business certification. 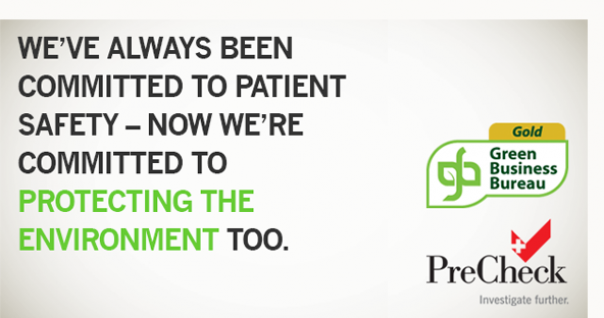 PreCheck, a background screening firm focused on serving the healthcare industry’s employment screening and credentialing needs, announced it has recently earned Gold level green business certification by the Green Business Bureau (GBB). During its twentieth anniversary serving the healthcare industry, PreCheck decided to join the Green Business Bureau in an effort to minimize the company’s environmental impacts. The Green Business Bureau is a national membership organization that uses an online assessment to certify green businesses. After becoming a member of the Green Business Bureau earlier this year, PreCheck adopted a corporate environmental sustainability vision that was shared with employees. The company’s operations building in New Mexico was designed using the latest energy saving ideas, from solar panels that generate electricity to its “super insulation system” that combines concrete and two layers of a type of Styrofoam, to achieve a zero-carbon footprint. PreCheck’s Chief Executive Officer, Glenn Woolsey, was responsible for the environmental sustainability design of the building in 2008. This week, PreCheck is initiating an effort to begin e-mail delivery of invoices and account statements to its clients. Once the transition to digital billing is complete, the company will save over 100,000 pages per year in printing and postage service carbon footprints. Bryan Barajas, Marketing Director, states, “As a company, patient care and healthcare are central to who we are. While we make a difference each day by safeguarding healthcare facilities for patients and their families, we are also committed to protecting our environment.” By joining the Green Business Bureau, PreCheck is contributing to the education and promotion of green businesses while spreading environmental consciousness among their customers. Founded in 1983, PreCheck, Inc. has focused exclusively on serving the healthcare industry’s background screening and employment qualification needs since 1993. PreCheck serves over 3,000 hospitals, long-term care facilities, clinics, educational institutions, and other ancillary healthcare organizations, across the U.S. PreCheck has evolved over time from a background screening provider into a turnkey outsourcing solutions provider, offering a full suite of background screening, compliance, and credentialing solutions all designed to help its clients adhere to the complex laws and regulations governing the healthcare industry. Based in Houston, PreCheck was recognized as a 2013 Inc. 5000 company and has achieved Background Screening Credentialing Council Accreditation by the National Association of Professional Background Screeners. Go to Precheck.com for more information.